Two months post-contract signing, Australia’s Bhagwan Marine received the delivery of Damen ASD 2310. The tug, named Bhagwan Pride, will begin her duties with operations at an LNG development near the Barrow Island Marine Park, off the Australian West Coast. The Damen ASD 2310 is a mainstay of coastal and harbour towing and push-pull operations. The Bhagwan Pride has an ahead bollard pull of 48.7 ton and 46.5 ton astern – the total output of 3,000bkW provided by two Caterpillar 3512C TA engines. She will be mobilized for towing barges loaded with equipment. Due to the development's close proximity to Barrow Island, Damen was also involved in compliance with strict environmental regulations. This area is home to a range of marine flora and fauna unique to Australian waters. “Before we delivered the tug, we had to get the hull checked to ensure we weren’t inadvertently importing in any alien species to this delicate marine environment,” explains Damen Asia-Pacific Area Director Roland Briene. The Bhagwan Pride was constructed in China at Damen Shipyards Changde, with only minor modifications. “To set the vessel up for Australian waters we had to make a few changes,” says Briene. “These involved local standards of safety and electrical systems.” The delivery of the Bhagwan Pride follows the Bhagwan Power, a Damen ASD 2810 delivered last year from Damen Song Cam Shipyard in Vietnam. 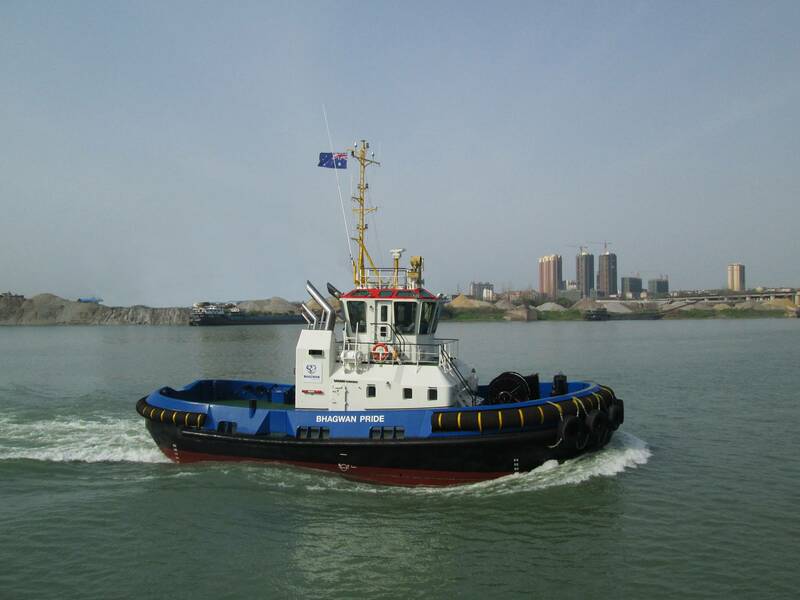 “These two Damen tugs will now be working side by side on the same project,” continues Briene. Based in Western Australia, Bhagwan Marine provides services to the oil&gas and renewables industries, with a fleet that exceeds 100 vessels.